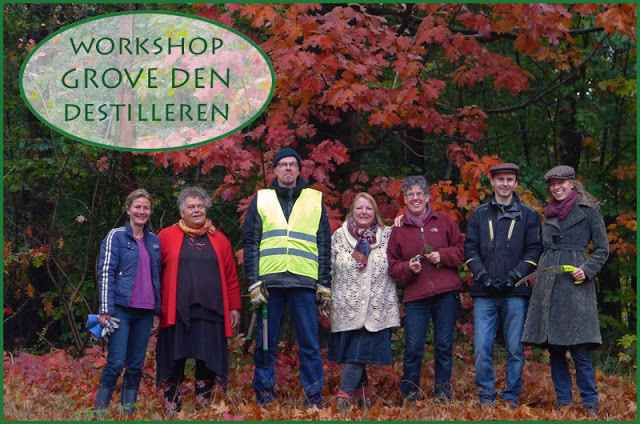 On April 24th we held an walk inn and start of the new season of INDEKOPERENKETEL. Despite the cold weather and heavy hailstorms covering the workshop place in Gilze there was no lack of interest in our activities! The fact that we participated as a ” honk ” (stamp-post) to this first Toerlezjoere-cycle tour day combined with our annual start of the season. To us its a great opportunity to show habitants and neighbours from the region our activities. At 10 o’clock in the morning people were curious in our barnyard to take a look in our destilling working place. One of them actually helped Henk by chopping the harvested Douglas Fir from the Chaamse forest nearby. 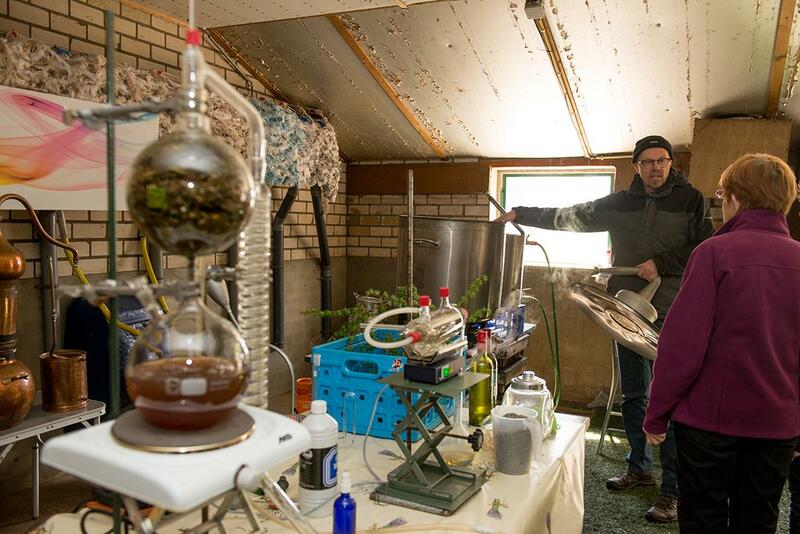 Henk planned to a destillation of Douglas Fir in the 150 liter distilling kettle still. Due to low temperatures he changed plans and used instead the glas glas distilling formation with a capacity of only 2 Liter. 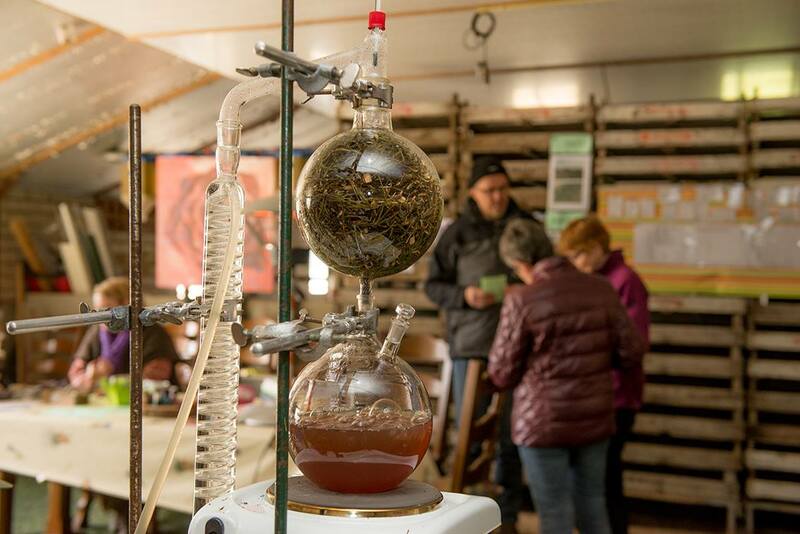 But also suitable in a fine way to expose the principles of steam distillation and especially to smell the scent of the oil and hydrosols. 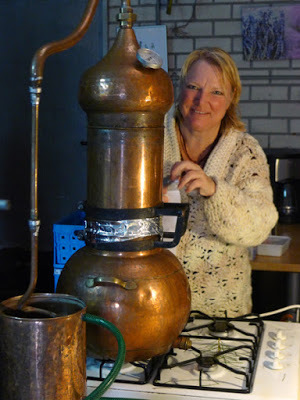 Next to this distillation formation set Henk had also a smaller set for distilling with a capacity of 100 mL dried lavandin flowers. 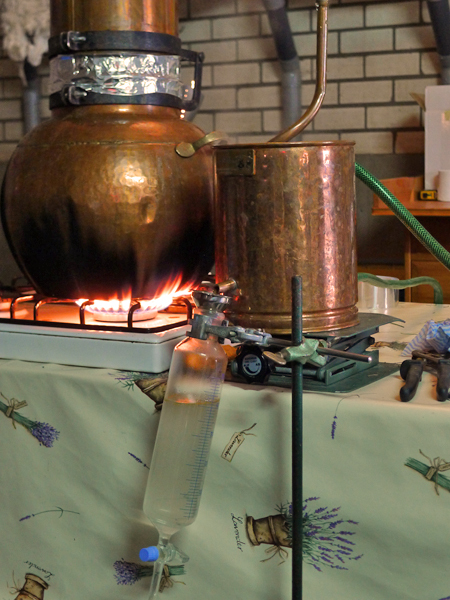 By not using a cooling equipment the fresh scent of lavandin spread during this distillation proces in het workshop place. A nice place to be compared to the hailstorms and cold weather outdoors! Thats the reason we only do distillations in the warm season between April and October. At the end of the afternoon after five o’clock around 60 people visited our distilling working place. That means that by now our activities are becoming more and more known in Gilze and the surrounding region.